"Follow the white rabbit." Now where have I heard that one before? Sorry, but it's not The Matrix this time. It's better! It's Trapped Part 1: The White Rabbit — the first installment of a trilogy of point-and-click adventure games from Rodrigo Roesler of Rabbit Tell. The game is an interesting twist on your standard point-and-click. While you still use found items to solve puzzles and escape the house in which you are trapped, Trapped trades in the standard first person view for a pseudo-3D isometric third person perspective. The story is nothing new: you wake up in a room next to a dead guy and you have to escape the house. Use your clicking finger and your puzzling skills to collect items and combine items, and to get out. Analysis: As with many Flash escape games, the story is certainly not the high point of the game. However, the game does have some great features. The puzzles are quite odd while still maintaining some sense of logic. Thankfully, all of the objects are findable and have a purpose, and none have to be combined randomly. The puzzles are very difficult, but all have solid logic behind a solution. The interface is a bit annoying at first, since you have to click twice to get an object and then click another button to drop it, but can be streamlined through keyboard shortcuts. The only real problem I had with the game was the size, as it is a bit small. This size is probably necessary to fit the isometric view, but causes a little bit of squinting after a while. On the other hand, there is no pixel-hunting required, since the cursor indicates when you hover over a clickable object. My favorite part of the game is the extensive behind-the-scenes look Rodrigo provides in the "About" section. Can you guess how long he has been working on it? If you knew, you would understand how he has managed to make it run so smoothly. Rodrigo has been working on this first game for a long time, and I can't wait to play parts 2 and 3. Until then, will you take the red pill, or the blue pill? Or you can just play Trapped Part 1: The White Rabbit. 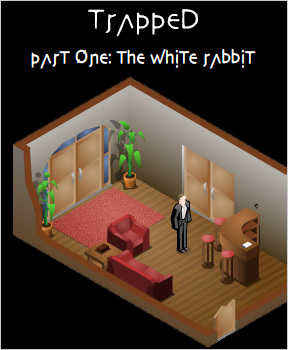 Trapped Part 1: The White Rabbit Walkthrough now available! Click on the dead man, get the King's coin. Click on him again, get the Dead man's key. Click on the box full of toys, get the key in the bottle. Click on the tall closet, get the triangular brick. Use the Dead man's key on the door to unlock it. Click on the door to exit to the hallway. click on the southeast door to enter into the bathroom. Click on the sink to get the brush. Click on the bathtub to get the polygonal block. Click on the cupboard to get the steroids. Click on the cupboard to get the sick man coin. Click on the door to exit back into the hallway. click on the northeast door to enter into the library. Click on the couch to get the servant's coin. Click on the table near the door to get the note. Click on the bookcase to get the torn page. Click on the door to return to the hallway. click on the north-northwest door to enter into the main hall. Click on the western plant to get the peasant coin. Click on the bar to get a corkscrew. Use the bottle on the wall-bottle opener to get the small key. Use the small key on the short dresser. Click on the short dresser again to get the square block. Return to the Main hall and click on the east-southeast door to enter the kitchen. Click on the cupboards to get the spoon. Click on the cupboards to get the maid coin. Click on the bowl on the table to get the orange. Click on it again to get the pear. Click on the fridge to get the soda. Use the corkscrew on the door next to the one you entered from. Click on it to enter the pantry. Click on the key on the wall to get the key. Click on the shadow behind the paint bucket to get the axe. Click on the shelf to get the broken ice pick. Return to the kitchen and use the key on the southeast door to go to the yard. Use the spoon on the brown circle to get the dog coin. Use the pear seeds on the hole. Use the steroids on the brown circle. Click on the tree to get the mutant pear. use the axe on the tree to get the firewood. Go back to the kitchen. use the ice pick on the charcoal in the sink. Use the pear on the red paint. Go back into the main hall. Use the ice pick on the notepad on the bar. Go back to the yard. Use the apple on the child statue. Click on the rabbit statue. Go back to the bedroom. Click on the girl to get the key. Use triangle block on the box on the bed. Use the square block on the box on the bed. Use the polygonal block on the box on the bed. Use the orange on the block on the bed to get the picture. Return to the main hall. Use the key on the door directly across from the kitchen. Click on the china cabinet to get the glass. Click the table to get the Glutton coin. Click on the side tablecloth to get the knife. Click on the double doors to unlock them. Click on them again to go into the Main hall. use the knife on the westmost barstool to get the Bafoon coin. Click on the arrow to get the arrow. Go to the kitchen and use the arrow on the sink to get the key. Use the glass on the pot of water to get the glass fo water. Go back to the small hallway and use the key on the west-northwest door. Click on it to enter the master bedroom. Click on the bed to get the queen coin. Click on the desk covered in papers to get the glued paper. Use the water glass on the piano. Press the middle key twice; the key immediately right of it once, and then the glass twice. Click on the big red thing to enter the secret room. Click on the desk to get the assassin coin. Click on the desk to get the lamp. Click on the desk twice more to read the diary. Go back to the master bedroom. Click on the clock. Drag the hands to 2:15. Use the lamp on the stove. use the lighter on the stove. Use the glued paper on the boiling water. Use the can of cola on the dark spon on the wall. Use the brush on the dark spot on the wall. Use any of your coins on the dark spot on the wall. King, queen, assassin, glutton, peasant, sick man, maid, buffoon, dog, servant. Click on the hole to end the game. Well, this game is incredibly smooth, and really difficult. Overall, I have to say I like it. I love the isometric view; it's one of my favorite styles, but my question is: if it's in flash, it must be a vector graphic. If it's a vector graphic, couldn't it be bigger? My only real complaint; in fact the game is really really nice to play. Lots of items too. Makes you feel like you accomplish something, even when you get stuck with 20ish of them in your inventory. Great game! Having fun even though I'm already stuck! I sent this one in yesterday as well, glad you guys put it up on your site. If anyone needs help beating it post your questions and i will try and answer them for you as best I can. Some of the puzzles are a bit of a pain and it took me a good hour or 2 to beat. Also, i'm a huge fan of isometric view dating back to the old Crusader games for dos (look them up, they were really good) and of course all of the old Black Isle\Bioware games like baldur's gate\icewind\planescape(now there is an awesome game). I wish more game devs used Isometric instead of first person all the time. Very fun and extremely smooth. The challenge is nice, though I do wish it were bigger. Definitely one of the nicest I've ever played. I know I am close...but there's two things I can't figure out. but i'm stuck there. any hints? the clock, which I am clueless with. Right: Awesome game, finally beat it. In the end, clicking each object on each object seemed to work out for me fine. Nevermind, I got it. Nice game! get into the locked room beside the Hall?? You use the lamp on the stove, soaking the wood in oil. You then use the lighter. You then steam apart the glued peices of paper. planting the pear in the hole you dug with the spoon? How did you find keys or access to other rooms? Hi! I'm stuck... I don't know how to get the writing off the pad, where to find wood, how to open several of the doors, where to find the last piece for the child's puzzle, how to get a hook for the ice pick... I've been through every room five times or so. My inventory includes soda can, ice pick, axe, orange, brush, lighter, note and memo. Any clues would be appreciated. Thanks! What did William Tell shoot? Jump in Hole under Rabbit Statue. There is no circle block, you'll have to improvise with something else. You don't need a very big object to dig with, just one that's about the right shape. You need something that looks like an apple. A red apple. After that's in place, go check on the dead man. Ever noticed the lovely tone you get when you ring a crystal water glass? A pencil would be perfect, but we don't have one. We do have something about the right shape, if we could only cover it in carbon. 1. Check the body twice. You'll get the King's Coin and the Dead Man's Key. Check in the toy box for a bottle with a key in it. Move over to the cabinets for a triangle block. Click the door to leave the room, the dead man's key will be used automatically. 2. Now that you're in this narrow hallway, go through the second door on your left to end up in the Hall. Check the left plant for the Peasant coin and under the bar for a corkscrew. Use that bottle you got earlier on the opener on the wall to retrieve the small key. Go back to the bedroom. 3. Now that you have the small key, open the drawers to retrieve a square block. Go back to the hallway but now open the only door on your right. You're now in the bathroom. 4. Check the tub for a Pentagon block, the sink for a brush, and the freezer for Anabolic steroids and the Sick Man coin. Head back into the hallway and take the door at the end of the hallway to the living room. 5. Check the table for a memo, the couch for a servant coin, and the bookshelf for a torn page. Go back to the hall through the hallway, and use the door in the upper right to enter the kitchen. 6. Check the bowl on the table for an orange and a half-pear with seeds in it, the fridge for a soda, and the top cabinets for a spoon and the maid coin. Use the corkscrew on the door with no handle next to where you came in. Grab the key off the wall, the axe off the ground, and the broken icepick from the shelf. Use the icepick on the charcoal dust in the kitchen(just trust me on this one). Leave through the door on the right to go in the yard. 7. Use the spoon on the dirt to get the dog coin, then bury the pear and the anabolic steroids. Note the statues. Go inside, then come back outside. Grab the mutant pear off the tree, then use the axe on the tree to get a pile of wood. Go back to the pantry, put the mutant pear in the red paint, then come back and place the now fake apple on the boy statue. Go back to the bedroom you started in, but on your way, use the ice pick on the notepad in the hall. Don't worry about remembering this location, it's marked on your map now. 9. Get the glass from the shelves, the Gluton coin from the table, and the knife from under the white spread in the bottom corner of the room. Leave through the double doors into the hall. 10. Now to jump between a couple rooms. While you're in the hall, use that knife of yours to cut open the center barstool to get the Bafoon coin. Check out the music box on the table before you run across the hallway to the bathroom to get the arrow stuck in the wall. Go back through the hall to the kitchen. Use the arrow on the drain in the sink to get the Drain key, and use the glass in the pot of water(on the black stove) to fill it. Go back to the hallway. 11. Now you can open that door on the left that has been locked this whole game! Check the desk for some glued papers, and the bed for the Queen coin. Go over to the piano. Remember that music box tune? Good! Unfortunately, one key is broken. Luckily you have that glass to make up for it! Incase you forgot the tune, use the glass on the piano, and hit middle, middle, right, glass, glass(remember the memo? You only need the first five notes to unlock the secret). Go through the red door. Get the Assassin Coin and Oil lamp off the desk, then read the Diary. Set the clock in the bedroom to 2:15 just to save a little time(no pun intended). Go back to the kitchen. 12. Use the wood, then the oil lamp, then the lighter on the stove to get a fire going, then put the glued papers over the steam to loosen the glue and you have yourself a torn page. "A quarter of the hour has passed since the two strikes." 2:15! Good thing we already set the clock. Also note on the page that the Queen and King switch seats. Go out the door into the yard. 14. The rabbit statue is now gone, check the hole. You can't see the bottom, but you might as well do what Becky said and jump in. Congratulations! Part One is finished! I'd need a magnifying glass to play this game, the game itself is so darn small. Creepy story, but GREAT GAME! I needed the walkthrough otherwise I couldn't have beaten the game. Sorry if somebody else posted this. Why is there a refrigerator in the bathroom? Oh, right, because there's an item that needs something to be in. It looks more like a fridge than a medicine cabinet, though. no matter how many times I play the piano with the glass, in the correct order, the secret room will not open. Great game, only need help where to find the knife and then I was good on the rest. 3 walkthroughs within an hour? Haha, at least some people are on top of things! Wow, that was a great game! I like the new perspective on the escape the room game, with a little bit of Gateway thrown in. A few red herrings thrown in there for fun.I hope we don't have to wait too long for the next one! Did the clock do anything? I really enjoyed this; the interface was refreshing for a point and click game, and the puzzles were at a good level of challenging without being too abstract in their solutions. I would have liked more sound, though, and also for it to have been slightly larger. Can't wait for "The Dark"! If it's too small then lower your screen resolution while you play. It helps! I never would have figured out without the walkthrough. I used the Mac's built-in screen zooming to make it fill the screen, which made it MUCH easier. The only thing that bugged me, and it bugged me a lot, was the spelling. How hard is it to look up words like "glutton" and "buffoon" before using them, instead of making wild guesses? Can't wait for the sequels! I personally thought this game was great. There should be more room escape games with this same third-person concept like this. The one thing I found annoying was the time it took the character to walk around. For example, walking from one end of the yard to the other takes far longer than it should. But besides that, I found the game very enjoyable. Good choice. If you haven't finished the puzzle, then this won't really make sense. Jay wrote me an e-mail about this review, and I found it great. Kostia, thanks for the tip. I uploaded a correction just now. Sorry about that, neither me nor Bruno have english as our first language. I'm sure there's more errors like these in the website. This game isn't great. It looks pretty but makes too many bad adventure game mistakes. By offering multiple items that could reasonably be used to complete a task but only permitting one answer you get into the situation where you know exactly what you have to do but can't do it outside of the order the designer intended. Despite the review claiming a "solid logic" lies behind the puzzles, this logic is entirely internal to the game. The real world setting is betrayed by electing to stick items in random locations, having puzzles for their own sake, and having some puzzles (and one in particular) that require truly insane leaps of reckoning that the mundane setting wouldn't suggest. Doesn't seem to work properly with Firefox, either. Great game, Rodrigo. Incredibly smooth and well designed. The isometric design works particularly well. I'm really looking forward to the other two parts. And "Farewell, mutant tree"...What a line! This is probably the best escape game I've played. Every puzzle was intuitive. It made complete sense where to use each object and the subtle hints/ riddles were written perfectly. It made me think, but I didn't have to use the walk through at all. I hope Rodrigo continues on designing games as high quality as this one! Good Job! I really enjoyed this one, and like someone said, probably one of the best ETR games I've played. I'm looking forward to parts two and three. Fantastic game! I can't wait to play the other levels! Am I the only one who found the rabbit coin? I don't know what it's good for, though. in the hallway, there's a spot on the wall between the two doors at the top right. Use the axe. ?! The only way you figure that out is by either trying absolutely everything or by using the walkthrough. Games that refuse to let you use logic are lame and this game gets two thumbs way way down. Greg... it wasn't *so* illogical; using steroids made some sense. Also, it's routine to routinely try objects in your arsenal here and there. In the walkthrough, the time should have been fixed after the paper was unglued, but I guess we know why he saved us that extra trip. I really enjoyed this game, definitely one of the better ones! Though, why is it that every game that has writing/notes/conversation involved, there are spelling/grammar mistakes aplenty? Lolz. I worked out very quickly that I needed to use the charcoal on the paper on the bar, but using a broken icepick to pick it up?! Personally I found the game frustrating: I agree that several puzzles were logical (at least if one has played games of this sort many times before--can't eat steroids, must have to plant them), but others for which I relied on walkthroughs still made little sense to me after the fact. I also found the interface boring after a time: waiting to move from one side of the room to another again and again didn't keep me invested. All that said, it's a polished, complex game and definitely in the top quartile of point-and-click titles. But really I just wanted to post a grumpy old scholar's note regarding the review: The Matrix if not the source of following white rabbits (or of pills of different colors, for that matter) any more than Shakespeare needs to be read in the original Klingon. Charles Dodgson/Lewis Carroll may well have been amused that a multicultural, multi-genre pastiche like The Matrix receives for all sorts of credit for originality from people who aren't aware of the literary, graphic (Manga), or cinematic sources of its ideas and visuals, but I hope we can at least hang onto the timeline that places Alice in Wonderland prior to Keanu Reeves. Grumpy rant over. I'm having problems placing the coins. Whenever I try to use one, it says that I can't use it. What am I doing wrong? The size of the screen was small but if you zoom your screen to 150% it works quite well. It worked fine for me in firefox, what version were you using? Great game, real challenging. Only got stuck on one part, turning the apple red. But the great walk though helped a bunch. Looking forward to part II and III. My god, I would have been so mad if I hadn't read The_Corruptor ('s) spoiler..... I beat the game, but it won't finish. Which hole do I click to finish it off? loved the game no idea what the clocks for but cant wait for the next chapter bring it on!!! Thank you all. Tolkar, thanks for the tip, but I can be more nerd (nerdier?) - Traditionally, in clocks, the roman 4 is written IIII. There's a legend that a clockmaker commited that mistake when building aclock for a king, and had his head cut by it. Since then, and for a long time, every clock was built with the same mistake, in his honor. you can find it by hacking the wall between the two doors in the main hall with the axe. Everyone keeps talking about this lighter. I don't have it...or I don't know where to click to find it. Also, it is making me craaaaazy. where is the hole to end the game?? i put all the coins in the slots and someone told me theres a hole to end the game. where is it? Maid, Buffon, Dog, Servant but that darn rabbit is still there and it says Still Stupid. What am I doing wrong? Yea, I have the same problem- I did it all, I put the coins in the right places and now what? I can't do anything :( And why I need to set the clock on 2:15- I can't see if something is different. Help- I just need one more click and I don't nkow where! i did the coins and the stupid rabbit wont go away should i take it and throw it? Finaly! It tok me a little while to do it.. But i did it..! Without walktrough.. AlmostXP... When i had to to that thing with the coins in the end.. I was stuck.. I cant find the patch, where is it. I've put in the correct order of coins according to a couple walkthroughs, but I can't seem to finish. I can't figure out where the dark patch on the outside wall is. I've tried using the can of cola all over and it's not doing anything. Can anyone help me find the right spot!? PLEASE!! Thanks!! there are 3 rooms locked now the 2 big doors and the one small door in the same room how do i open them?? hey when you said to leave and come back for the pears (seed) what do i have to do? How do I use the corkscrew to open the bottle with the key? i'm just going from one to the other. Nevermind didn't see the wall bottle opener. i'm stucked with the piano. i have the code from the music box, and a tip to use only first five notes, and have the glass on the piano tips, but, after i play the sound, nothing happens. Alright Im at the end of the whole game with only a few problems but I have the coins in the right order according to the picture and ive tried double clicking the coins but the rabit hole still wont appear what am I doing wrong? Any news/info about the sequel? the clock is on 2:15, I have all of the coins. Why is the rabbit still out there and why do I see no hole? HELP!!! My Small Key Is Gone!! WHY CANT I BEAT PUZZLE (Or However You Spell That) GAME?!? This game reminds me a lot of "Silent Hill 2". the circle. Do you have something else that's round that might fit in the same place? This is a GREAT game. I can't wait for the next one. OK, All the people are there in the right order... and i switched the king and queen, and the clock is at 2:15, and yet there is no rabbit hole.... WHAT AM I DOING WRONG!? as well as the lighter and the knife. i tried to put in the well, but a writing apperared: "i don't want to miss this coin"
so i think it will be important in part three. is it just me, or does this game absolutely AGES to load. i can not find the Bafoon coin!!! can someone pls help me??? cause my english is not so good and don't understand that word: "westmost barstool "
I know how to find the rabbit coin!!! it's not as easy as hit the wall in the hall.. You have to click like craqzy between the kitchen door and the dining room door. It's in the higher piece of wall you can see. I'm explaining it because it wasn't very clear in previous posts. Awesome game ever, now I am playing part two. Oh My Gosh. I can't get onto the game because it takes me to this stupid Brazilian site advertising this plug-in that costs $15. Please please help! I've already played this game once but I haven't played the third one and I would be SO sad if I couldn't ever get on this dude's site again. es bueno, quiero que salga 'the laberint' o como sea en español, pero en ingles igual me sirve, estoy emocionada por el final!!!! hey i'm trying to get my friend to play this game but all i get is the 404 error does anyone know where the game was moved to? for a while .But not when i try to connect i get an error message. I think the link is broken or something. I don't understand how you are supposed to figure out the order that the coins go in. the ice pick in the charcoal. Trying hard to do the piano thing. Can anyone please help me? I would appreciate it. had the king and queen the wrong way round! I can't get the soda on the wall thingy. Any suggestions? Thanks. Thought I'd mention this here as well. remember you have to use the axe on that spot BEFORE cutting down the mutant tree, otherwise you won't be able to pick it up again and would have to restart. After looking through all the comments, nobody has posted a clear guide on how to finish the game yet. I have the full (2 halves) page. They are all inserted as described in several other plees for help. Why has no-one helped us yet? Are we missing something vital, or is the game just buggy? second torn page from the glued papers! (out of either fear or hope to gain the throne, the Queen asks the King to switch places. It worked. I can't find the rabbit coin, i need to know how to get the coin without getting the firewood, but you need the firewood to finish the game...or do you? I'm probably going to play this game, so are there any scary bits? Like disturbing images, sounds, or things that jump out and go OOGABOOGA! at you? i know i have to use the axe but where? I'm still stuck on the piano and what do they mean press on the middle key twice and immediately right one and glass twice I don't know which one is the middle??? OMG! We must have been thinking the same thing, because I just played the Trapped series yesterday! I really like this game because this was reviewed before I join/discovered the site, but is there still some help available here if I ask? I'm just having trouble with the bonus coins (rabbit coin, etc.) and whatever else you need to unlock that has been mentioned in the previous comments. Thanks very much! I can't play this game, because all text that shows up just says "undefined". I can't tell what some objects are and can't read any descriptions or story. I am using the newest Flash player and Firefox 19.0 on Windows 7.
if you have an adblocker plugin for your browser, disable it for the site.